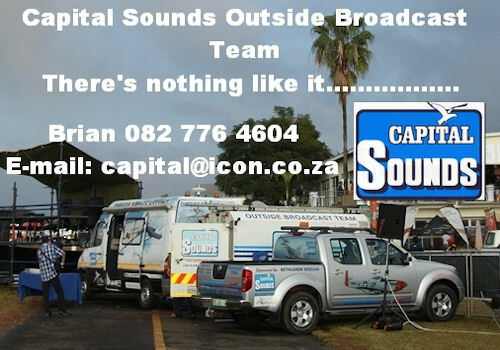 30 March to Sunday 1 April: Icarus X Series Race at Skywalk Hartebeespoort Dam. 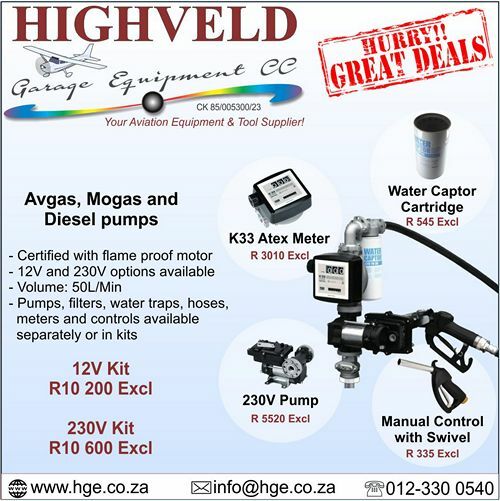 Contact Ronnie Beukes ronnie@skywalk.co.za. 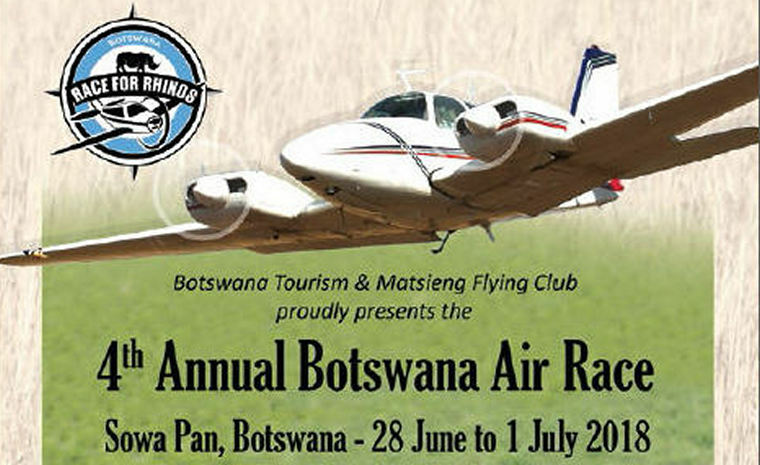 31: Witbank Aeronautical Association will be having a fly-in breakfast. 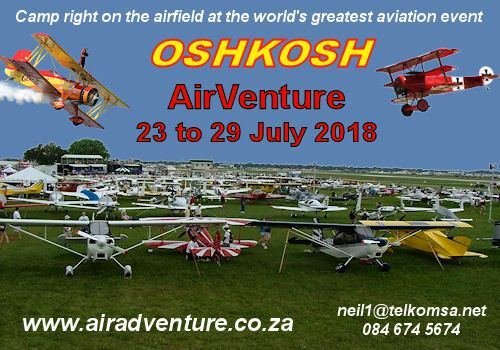 Please notify Robert Clark via SMS / WhatsApp (082 463 1372) or email (Comms@flywaa.co.za) how many people will be attending the fly-in. 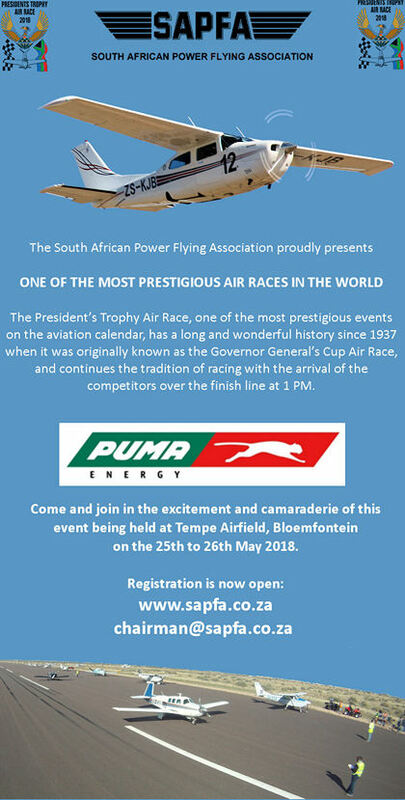 24 - 26: SAPFA President's Air Race Tempe, Bloemfontein. Rob Jonkers chairman@sapfa.co.za Website: www.sapfa.org.za E-mail: Race@sapfa.org.za. Race director Robin Spencer-Scarr: E-mail: robin@stylegroup.com.au. In 1919 The 1919 Great Air Race captured the imagination of people across the globe when Captain Smith, Lieutenant Keith Smith and Sergeants Wally Shiers and Jim Bennett won the 1919 Great Air Race when they flew a Vickers Vimy Biplane over 18,000 km in 28 days from London to Darwin in Australia. To celebrate the event the Australian Northern Territories plans to stage a Centenary E-Race that will again start in London stopping in at least 15 countries before finishing in Darwin. This time the aircraft though will be completely different. 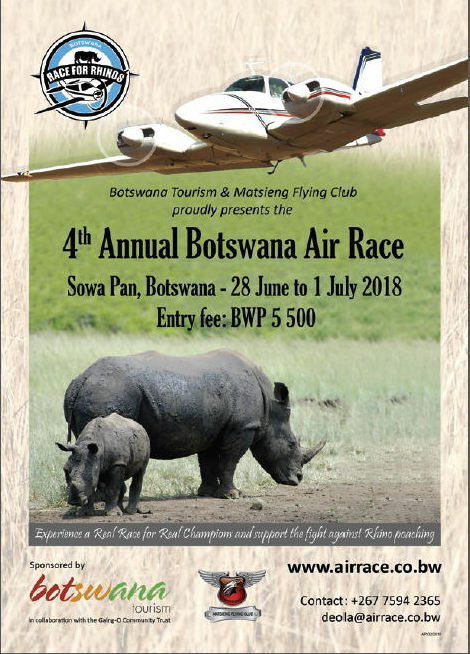 The 2019 Centenary E- Race will be restricted to low pollution, electrically-powered and highly efficient aircraft, ushering in the next century of quiet, environmentally-friendly aviation. 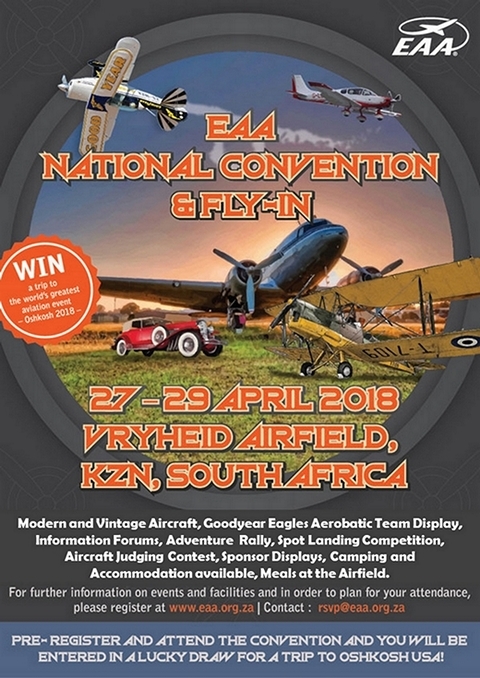 The Government is hoping that companies including Tesla, NASA, Airbus, Virgin and Boeing and other manufacturers of electric powered aircraft will enter the Race which will be a celebration of a century of aviation innovation and achievement by engineers, designers and aircraft constructors. Professor Storey, Australia's leading expert in battery and solar technology and long-time collaborator on the World Solar Challenge said; "The event is technically feasible, however, completing the route in an electric aircraft is by no means a foregone conclusion." As the global SR Series fleet approaches 10 million flight hours in over 60 countries, the company has also ramped up production of its turbine aircraft - the world's first single-engine Personal Jet™, the SF50 Vision® Jet - with 25 Vision Jets currently delivered and in service around the world. The past year marks the fourth consecutive year that Cirrus Aircraft has delivered more than 300 SR Series aircraft. Enterprise growth also propelled facilities expansion and employee growth across all Cirrus locations in Duluth, Minnesota, Grand Forks, North Dakota and Knoxville, Tennessee with nearly 300 jobs added in total over the last year. Included in the expansion is the Knoxville-based Vision Centre campus, which will open the doors to its new world-class Cirrus Approach™ training centre later this year. The new training centre will include a Level D full-motion Vision Jet simulator for the most advanced Cirrus transition training in the world. "Our goal remains revolutionizing the personal flying experience for the pilot and passenger through innovation in performance and safety," noted Cirrus Aircraft Co-founder and CEO, Dale Klapmeier. "Our strong results in 2017 are a direct result of how our mission resonates with our customers. 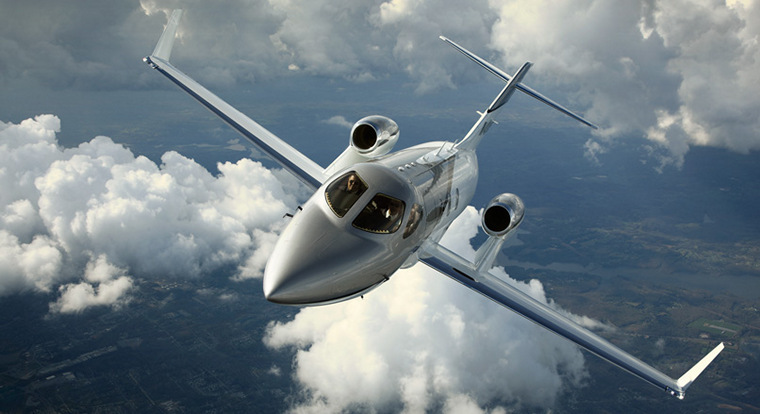 The SR Series, and now the Vision Jet, continues to reinvent personal aviation around the world." Wanfeng Aviation Industry Co., Ltd. acquired Diamond Aircraft Industries GmbH (DAI Austria), Diamond Aircraft Inc. (DAI Canada) and Austro Engine GmbH (AE) at the end of 2017. Photo © Diamond Aircraft. The new owner introduces the future group strategy with a focus on continued growth and DAI Austria as global headquarters, where it will continue to develop new technologies and aircraft models, including the DART civil turboprop aerobatic trainer and the DA50 models, for the global general aviation market. Christian Dries, former CEO of Diamond Aircraft Industries GmbH, who found the company more than 25 years ago and turned 60 last year decided to sell the entire company as he had no relative interested in taking over: "Diamond is my life's work. In the interest of a successful long term future, we needed to find the right partner to continue our good work. Wanfeng and specifically Mr. Bin Chen share my vision of the future of general aviation and are investing for the right reasons, with a long term strategy and the resources to see their vision through. I look forward to seeing Diamond develop further and based on our successful year long partnership in Diamond Canada, I am fully satisfied that I leave Diamond in very good hands." DAI Austria with more than 600 employees has been located at the airfield Wiener Neustadt East since 1987. The new owner has established the company as global headquarters for the whole Diamond Group. "Wanfeng is a global company that further grows companies all over the world. When we acquired 60% of Diamond Aircraft Canada's shares in December 2016, Diamond Canada hired about 100 new employees in the year thereafter. I set a clear goal that Diamond Aircraft is going to be the leading company in aviation. To reach this target I have appointed Diamond Aircraft Austria as global headquarters of the whole group. Therefore, the Austrian site will be further strengthened by recruiting more people especially for Research and Development, Sales and Marketing, Production as well as After Sales. We will also bring new opportunities to the local economy and community like we did in Canada." Mr. Bin Chen, Chairman of Wanfeng Aviation Industry and President of the Wanfeng Auto Holding Group said. Honda Aircraft Company announced that the HondaJet was the most delivered jet in its category for 2017, based on numbers provided by the General Aviation Manufacturers Association. Photo © Hondajet. "We would like to thank our customers for choosing the HondaJet for its value, features and performance, making it the most delivered jet in its category," said Honda Aircraft President and CEO Michimasa Fujino. "We look forward to continuing to create new value in business aviation across the world." In a ceremony held today at Pilatus Business Aircraft Ltd in Broomfield, Colorado, USA the first production PC-24 twin jet was handed over to U.S. customer PlaneSense. The aircraft is the first of six PC-24s which PlaneSense has on order with Pilatus. Photo © Pilatus. George Antoniadis, PlaneSense founder, President and CEO, stated at the ceremony: "We are honoured to be the launch customer for the PC-24, and are excited to add this versatile and unique jet to the PlaneSense fleet. We have greatly admired the quality and state of the art design of Pilatus aircraft, and are proud to have partnered with Pilatus for the last 22 years. 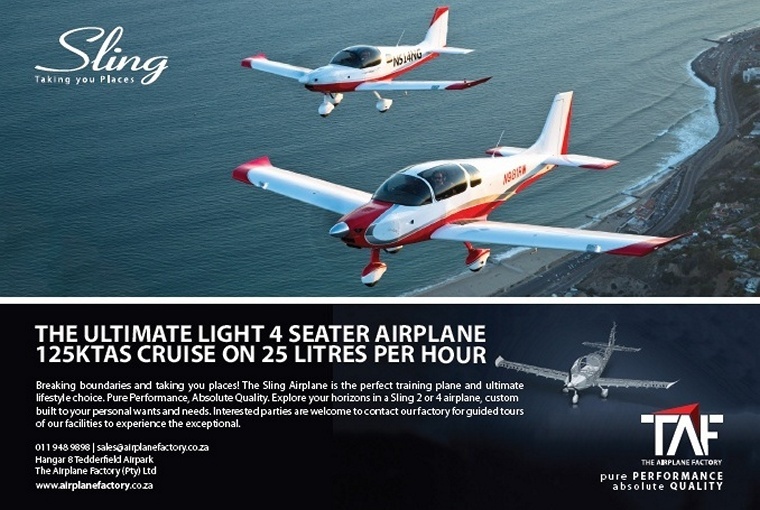 This is an exciting day for us, as well as for our clients who are eager to start flying in this fantastic aircraft." "We've been eagerly working toward this moment since the conception of this innovative new jet a decade ago. On behalf of the 2,000 Pilatus employees who successfully designed, built, and certified the best business aircraft in our 80-year company history, we are proud to have our long-time customer and partner PlaneSense take delivery of the very first PC-24." In addition to the larger cabin and faster speed, PlaneSense will take advantage of the PC-24's unique cargo door, short field performance, and ability to land on grass runways to access locations which traditional business jets are unable to use. As a result, the company has reinforced its position as UK market leader with 46% of the civil and parapublic market. This follows the company's long-term commitment, made in 2015, to invest in increasing its industrialisation in the UK; an Airbus home country. 2017 has seen continued growth in the commercial market, including the export to an undisclosed European customer of two H125s in border security configuration, an area where Airbus Helicopters' UK design team is recognised as having a world-leading capability. 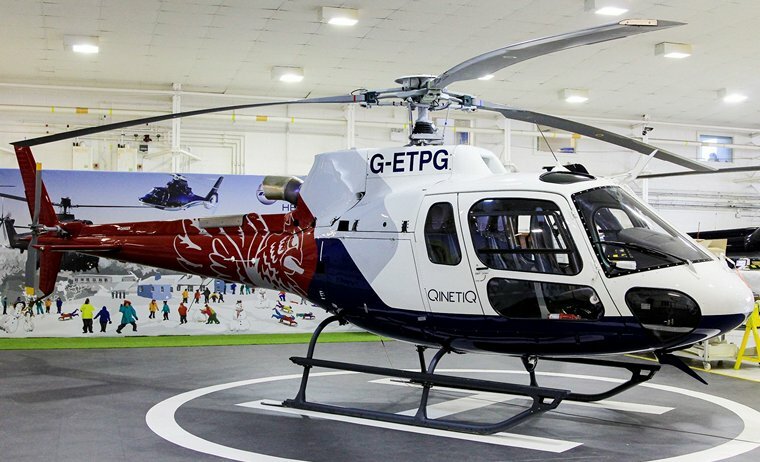 In addition, the company welcomed the order for four, heavily customised H125s for Qinetiq and which will be used as the new single-engine helicopter for the Empire Test Pilot School. The company also received orders for six new aircraft, a mix of single and twin-engine helicopters, in the private and business aviation segment, a core part of the company's UK market and the result of the UK team's expertise and offering in this sector. Since becoming the European hub for the newly launched Airbus Corporate Helicopters (ACH) last year, the company has set up an integrated sales network across Europe and inaugurated a new private and business customer facility at the company's Oxford-based headquarters. The company's success in the defence market was marked by achievements with UK Military Flying Training System (MFTS), where Airbus Helicopters UK delivered 25 H135 Juno - the highest number of H135s ever delivered to a single customer in a year. As aircraft service provider to UK MFTS, the company has now established its presence at RAF Shawbury, operating out of two hangars and where fully trained personnel are able to provide full maintenance and logistics support for the 29 H135 Juno helicopters. Similar facilities have been set up at RAF Valley to support the three H145 Jupiter helicopters based there. In addition, in late 2017 the company signed the £100m Puma 2 Follow-on Support Arrangement contract with the option for an extension until the currently planned out of service date of March 2025. As a result, Airbus Helicopters continues to strengthen its partnership with the UK MoD, ensuring a strong and sustainable base for the future growth of Airbus Helicopters core activities in the UK. Since the company's commitment in 2015 to increase industrialisation in the UK, Airbus Helicopters UK has expanded its teams, services and operations on all fronts. In support of the growing business and commitment to customers, the workforce has grown by more than 50% over the last four years. New services have been established to support maintenance for the latest, Helionix-equipped Airbus helicopters, while a new Helionix training simulator, at the company's Oxford-based headquarters, helps pilots familiarise themselves with the full spectrum of advanced avionics and auto-pilot suite. Today, Airbus Helicopters is by far the largest supplier of turbine helicopters in the UK including 100 helicopters operating with the Ministry of Defence, 100 per cent of the UK police helicopter fleet, as well as the majority of aircraft flying in support of the UK's critical national infrastructure. 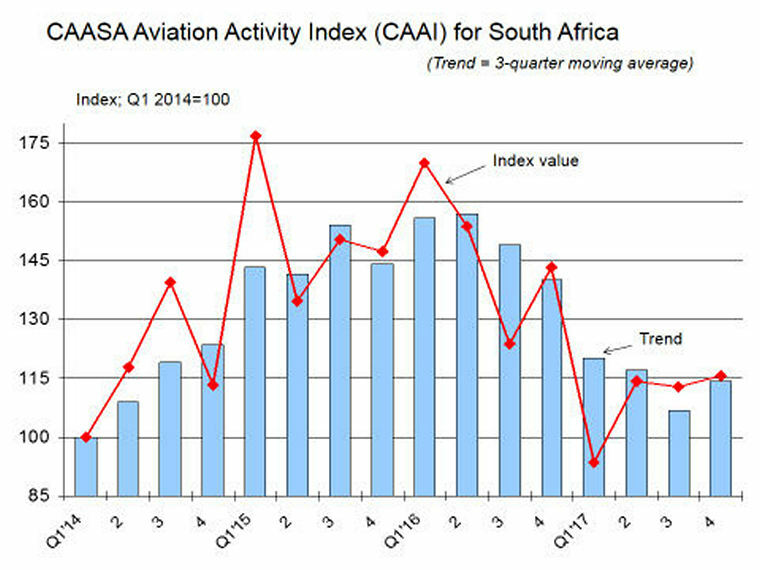 The Commercial Aviation Association of Southern Africa (CAASA) is proud to announce the results of its composite index of aviation activity for the 4th quarter of 2017. The CAASA Aviation Activity Index (CAAI) is based on 25 different indicators and provides an objective & balanced gauge of economic activity in the commercial aviation industry. Due to the short-term volatility inherent in purchasing and selling aircraft, where units are small, but the currency values are very high, the CAAI includes a trend that is based on a 3-month moving average. 2. In the process, the index value has further consolidated its modest recovery from a disappointing first quarter, which saw it slipping below the base period level of 100 for the first time. 6. The main drivers behind the positive trend of the CAAI since the beginning of the year have been the value of aircraft imports and air traffic movements (ATMs) at the majority of the country's largest airports. # Firstly, the recognition of the indispensable role that commercial aviation plays in facilitating the rapid transport of decision-makers in all spheres of society. # Secondly, individual data sets reflecting one or more areas of commercial aviation activity often contradict each other, particularly as a result of the capital intensive nature of the industry's asset base. 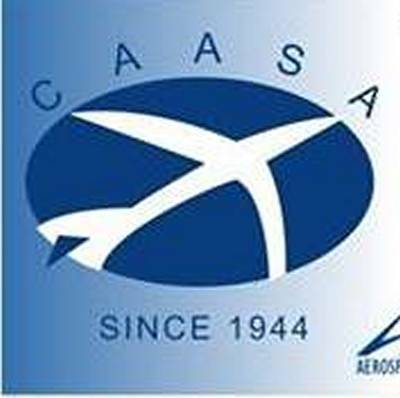 # Thirdly, CAASA has identified a need amongst its members and other stakeholders in aviation to contribute to the knowledge base of conditions in the aviation industry by forging a number of key indicators into a composite index, weighted in terms of their perceived contribution to the general trend in commercial aviation. Germany, Stuttgart: A "highly intoxicated" TAP Air Portugal co-pilot was arrested by police in the cockpit leaving more than 100 passengers stranded at Stuttgart airport. The pilot was reported to the authorities by an airport employee who had noticed the man walking unsteadily and smelling of alcohol. 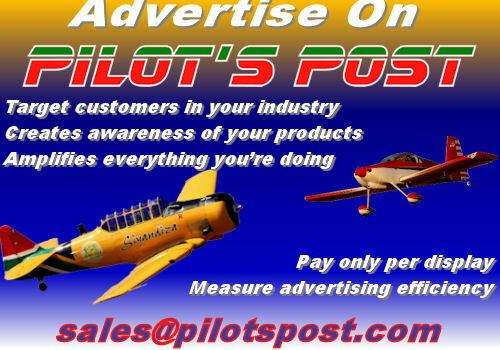 The man's co-pilot flying licence was immediately suspended by local prosecutors and bail was fixed at €10,000 (£9,000). Australia, Whitsunday islands: A Eurocopter EC120B Colibri crashed at sea 250 meters from remote Barrier Reef pontoon. Two occupants died, one was seriously injured and two others were slightly injured. Turkey, Ovaören: A Turkish Air Force pilot was killed when a he crashed his General Dynamics F-16 Fighting Falcon under unknown reasons. Canada, Halifax: A Condor Boeing 767-300 with 263 people on board on a flight from Havana Cuba to Frankfurt Germany was enroute at FL340 over the Atlantic Ocean about 410nm southeast of St. John's Canada when one of the flight crew members became incapacitated. The third flight crew member took over, the crew declared Mayday and diverted to St. John's. Due to the weather conditions at St. John's the crew subsequently decided to divert to Halifax where the aircraft landed about 2 hours later. Italy, Aosta: An Air France Boeing 777-300 enroute from Reunion to Paris Orly France when due to loss of communication the Italian Air Force dispatched two fighter aircraft to intercept the Boeing. The fighter aircraft intercepted the aircraft near Aosta and established radio contact and prompted the crew to perform a number of manoeuvres to verify the aircraft was not being hijacked and was under full control by the flight crew. 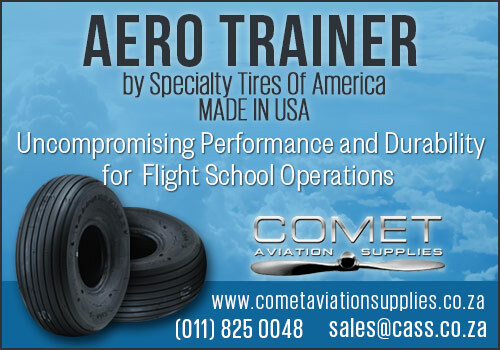 The aircraft flew a full circle as part of that verification. The aircraft was subsequently handed to French air traffic control and continued to Paris for a safe landing about 50 minutes later. A jet airliner exceeded Mach 1 for the first time in history, when a modified DC-8 Series 40 hit 667mph in a shallow dive. The Douglas DC-8 (also known as the McDonnell Douglas DC-8) is an American four-engine long-range narrow-body jet airliner built from 1958 to 1972 by the Douglas Aircraft Company. Launched after the competing Boeing 707, the DC-8 nevertheless kept Douglas in a strong position in the airliner market, and remained in production until 1972 when it began to be superseded by larger wide-body designs, including the Boeing 747, McDonnell Douglas DC-10 and Lockheed L-1011 TriStar. The DC-8's design allowed it a slightly larger cargo capacity than the 707 and some re-engined DC-8s are still in use as freighters. On 24 March 1960, a Douglas DC-8 broke the sound barrier at Mach 1.012 (660 mph/1,062 km/h) while in a controlled dive through 41,000 feet (12,497 m) and maintained that speed for 16 seconds. The flight was to collect data on a new leading-edge design for the wing, and while doing so, the DC-8 became the first civilian jet - and the first jet airliner - to make a supersonic flight. The aircraft was DC-8-43 registered CF-CPG later delivered to Canadian Pacific Air Lines. The aircraft, crewed by Captain William Magruder, First Officer Paul Patten, Flight Engineer Joseph Tomich and Flight Test Engineer Richard Edwards, took off from Edwards Air Force Base in California, and was accompanied to altitude by an F-104 Starfighter supersonic chase aircraft flown by Chuck Yeager.